This breed was prized by the hunters in the British Isles during the 1600s because of their ability of outstanding hunting. The Hunt Terrier breed nearly came to an end when the demand for sporting Terriers was reduced. However, they were revived, in the United States, by the enthusiasts of this breed in the 1970s. 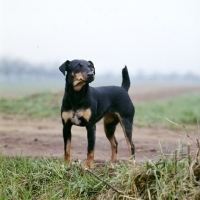 Since this breed of dogs is still rare, there is no known health problems associated with Hunt Terrier breed.